Feature on the history of advertising signboards, collecting tips, antique dealers, sign reproductions, and antique advertising shows. Free text sale advertising, fee for photo advertising. Offers sales, stallion service, equipment, shipping, and ranch advertising. Dedicated to advertising toy and bean bag collectors. Displays pictures and descriptions of unique advertising beanies, and promotional plush character collectibles. Collection of souvenir, figural, advertising and character snowdomes and information on collecting, trading, selling, and other collectors. Advertising pages for sellers, traders and buyers of parts, tools, services and materials related to Antique Gas Engines and Steam Engine collecting and restoration. A growing collection of pre-1960s print tobacco and cigarette advertising. Offers free photo advertising. Provides fee based advertising to businesses and stallion owners. This site aims to further the hobbies of stamp collecting (Philately) ,coin collecting (Numismatics) and banknote collecting by providing a listing of its members and activities. Media company site with details and advertising rates for the Tom and Keith Radio Show, plus access to current articles and advertising information for Arizona PubLinks magazine. A collectors site loaded with old tins and signs, country store items, antique advertising, and tobacciana. Large collections of advertising tins on display and for trade. Links to sales and information sites for starting a kids train collecting hobby. Webring designed to allow navigation between similar sites dealing with the hobby of collecting, and history of electronic calculators. Over 36,000 cans and bottles displayed of soda, beer cans, bottles, and advertising items. All about corkscrew collecting, the how to do it page. Offers information on restoring from Gary Sowatzka. Includes repair, grading, value, and collecting basics. Provides sale list, and links. Beer Can Collector web site includes information on collecting beer cans and how beer cans are graded and priced. Pictures of beer can types including cone top and flat top can plus pictures of his collection. Includes beer can collecting terminology. Links to other beer can collecting web sites. Offers free advertising for draft horses and draft equipment. Includes advertising for horses, tack, rescue sites, farms, and upcoming events. Offers web site design and hosting. Find a banknote glossary, fields of collecting, and places to obtain notes. Free monthly email newsletter with information, news & tidbits regarding the antique and collecting hobby. Collecting tips, trading links and general information on sand collecting. Stamp collecting guide and postal history for beginners and experts. Provides updates on new issues of stamps from around the stamp collecting world. Bookseller discusses collecting modern firsts (Alibris.com). Articles on collecting items from antique furniture to vintage flea market finds, plus features on caring for your collectibles, appraisal quiz, and calendar of antique shows. Sites having anything to do with action figure collecting: news, pictures, custom figures, archives, essays, and for sale lists. A collectors club devoted to the hobby of toy car collecting. The goal of the TMAC is to promote the joy of toy car collecting through meetings of like minded collectors. Article about collecting Bauer Pottery, including history, trivia, collecting tips, and recommended readings. From Country Living. If the business hours of American Sign Museum in may vary on holidays like Valentine’s Day, Washington’s Birthday, St. Patrick’s Day, Easter, Easter eve and Mother’s day. We display standard opening hours and price ranges in our profile site. We recommend to check out signmuseum.com/ for further information. 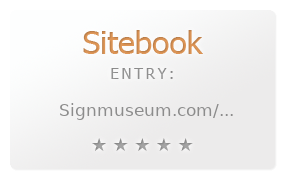 You can also search for Alternatives for signmuseum.com/ on our Review Site Sitebook.org All trademarks are the property of their respective owners. If we should delete this entry, please send us a short E-Mail.